Well, I found myself wondering what I was going to blog about this week, and found a post about troubled times, Lightworkers and crystals from one year ago. How can that be possible!? I took noticing the publish date on this post as a message or reminder from my past self to stay the course. Hopefully this reminder will resonate with you as well. I have edited and added to this post: Troubled Times, Lightworkers and Crystals. Lightworkers are healers, masters and servants of humanity who have contracted to come back at this time, when we know we can be of the most service. We come in all shapes and sizes, with many different skill sets and areas of expertise, with the common goal of service. Service to mankind and service to the Earth and all of her many inhabitants. To be sure, it’s not an easy task for which we have signed up. Lightworkers are beginning to awaken to our purpose now, during this time of great change, as the new era begins. It is both a scary and exciting time we are in. Soul contracts, both individual and as a group, are what we are playing out. 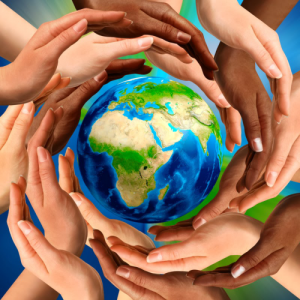 Look to your fellow Lightworkers, take their hands and know that together we can do anything! According to the Maya, Hopi and other indigenous peoples, with tradition passed on from generation to generation, this is the end of a cycle 28 thousand years long. This knowledge and these stories have been passed, hand to hand, not unlike the continuity of knowledge within the Crystal People. Humanity’s collective consciousness has held this knowledge safe for all of us. It is into this that we are tapping during the birth of this new era. Our ultimate goal is to raise the vibrations. With the help of our Crystal Friends, Angels and Guides, Lightworkers will raise our vibrations as the vibration of the planet increases as She ascends. It is our responsibility to help increase, and then to help maintain, the increased vibration that will be required for a successful completion of this cycle, thereby leading into the beginning of the next. By working with our personal crystals, and connecting with crystals still deep within the earth, we can assist with this vibratory increase. How in the world are we supposed to do this!? It has been a time of increasing turmoil, fear and uncertainty, globally; and we’re being fed a daily diet of the same from the mainstream media. I’m intentionally not mentioning specific events or people, because there are so many horrible things in the news (happening daily) I couldn’t possibly list them all. Try and remember that there are that many good things happening as well, on both the small scale and large. I know if you are like me, turning all of this madness around seems an impossible (and sometimes, almost hopeless) task. If you haven’t already, I suggest taking (at least) one break daily from the fear conditioning, and if you are already doing this, consider re-doubling your efforts. I suggest, instead of worrying, spend some time meditating, enjoying nature or communing with your Crystal Friends. I don’t mean adopt a “Pollyanna” attitude and ignore what is happening politically and globally, but I do suggest balancing the time spent. It’s good to remind ourselves that there is a LOT more good going on than bad. 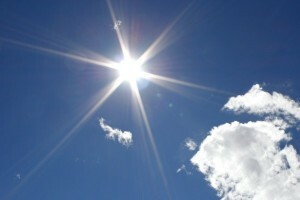 We are burning off a lot of karma and working through (and thus releasing) old patterns which no longer serve. So, during these times, look to the good, and more importantly, send love to those who seem impossibly hard to love right now. They need it. I know, for me, I have been experiencing a massive re-opening of old wounds, triggers and sore spots. How does one deal with this!? I find it most helpful to be in the present moment completely. I pull myself out of the past (regret/guilt) and drag myself from the future (worry/anxiety) and look to This Now Moment. I settle into the present. What am I doing in This Now Moment? Is everything OK right now, this second? Usually when I am in fear, panic or worry mode, I realize I am dwelling in times which aren’t real (past or future), and that in fact right now, all is well. Moment to moment. If I notice that things are NOT OK right now, this second, I look to fix just what is not well in that moment. How do the Crystal People help? 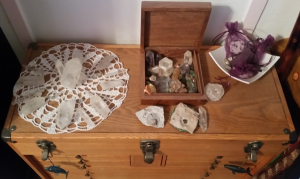 For me, I have crystals all over my desk, sitting on my computer monitor, some in my drinking water, usually one in my bra. 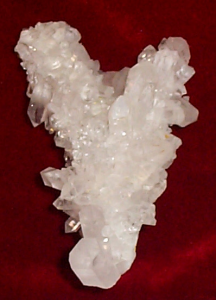 If I am wearing clothes with pockets, I often have a crystal in a pocket as well. The Crystal People help to remind me to ground, they raise my vibrations and depending on the type of crystal chosen, they help with specific issues. 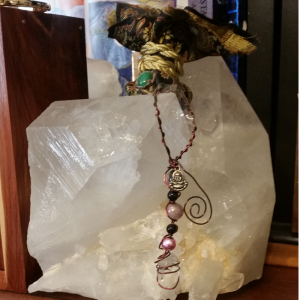 For example, if I am feeling flighty or spacey, I will put an Eight Sided Face Grounding crystal in one of these areas (desk, pocket or bra). If I need to create something specific, I have a Manifestation crystal. Is my communication with others suffering? I work with a Tabby crystal. Am I feeling blue and depressed? There is a lovely Rainbow crystal flashing her colors my way. Feeling unloved? Rose quartz to the rescue. The list goes on. 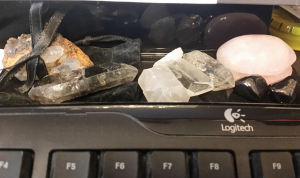 Each one of these crystals (and a few more) are in front of me on my desk, ready for action! While it is important to settle into the calm, it is also important to take action. I look to the world and everything seems so big and unmanageable. How can we possibly take enough action to FIX such a mess!? It looks like a huge knot of tangled threads that seems impossible to untangle. If these planetary challenges make you feel as overwhelmed as they do me, easily implement fixes on a SMALL scale. It’s easy, really. Clean up your own sandbox first. We fix this colossal mess one person at a time, starting with the person you see looking back at yourself in the mirror. Be kind to that person you see in the mirror. Don’t judge that person. Show that person love and gratitude. Anchor those good feelings and become familiar with them. Next, take those feelings and spread them around. Smile at the person in line with you at the store, be kinder in traffic. Beam your good intentions and hopeful positivity outward. Be of service. Lend a hand. Don’t buy into the doom and gloom of mainstream media. Look at the area around you and offer assistance locally. Help your neighbors! If we each take an active role in cleaning up our own back yards, soon, all the back yards in the world will be neat and tidy. These are easy steps to implement when we talk about being of service to people we love, like or even simply tolerate. The step for us to take as Lightworkers, is to implement these ideas with those we see as completely different from us. The people who hold ideas and values completely opposite to our views and opinions. People we just don’t like or who rub us the wrong way. Those who flip our triggers and cause us to recoil. I suggest we offer love and understanding to those with differing opinions and ideas. We don’t have to like the person’s stance or agree with their methods. We can still offer them love and understanding. See that they are people looking for the same things we are, simply in a different way. Do your best to set judgment aside and look for the similarities. When triggers are hit and old wounds are reopened (and they will be), offer those painful areas in yourself love and acceptance rather than avoidance and resistance. Take plenty of deep breaths, ground in nature, nurture and love yourself. Offer love and understanding to your perceived enemies, you might find you make new friends! Work with the Crystal People. Seek out uplifting stories and spread them around! As always, I am sending you love and healing balm, both from me and the Crystal People! We can do this. We are doing this. ALL IS WELL. Tagged crystals, how to. Bookmark the permalink. Hey, Thanks for sharing such informative blog about crystals. I love crystals as they look really beautiful and its effects are awesome.